Hill AFB is located south of Ogden, Utah and approximately 30 miles north of Salt Lake City. The base has a view of the Great Salt Lake to the west and the Wasatch Mountains in the east. It is a pleasant, military-friendly area for retirees who enjoy winter sports and outdoor activities. The 75th Air Base Wing of the Air Force Material Command serves as the host unit at Hill AFB. 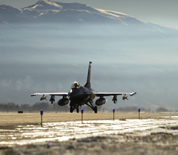 The wing is responsible for providing services and support for the Ogden Air Logistics Complex (OO-ALC). The OO-ALC provides engineering and logistics management for the F-16 Fighting Falcon, the A-10 Thunderbold II, and the Minuteman III intercontinental ballistic missile. This Hill AFB directory features the critical info you’ll need to navigate through the many facilities and recreational opportunities available on base.